Comics were not around during the life-time of Johann Wolfgang von Goethe, but as a prolific writer who sketched all his life, he would have loved them. The Goethe-Institut with its idea of discovering cultural trends and supporting emerging artists, realised the rising importance of comics as an art since 1990. Today, comic exhibitions and blogs, comic artists in residence, international workshops and festivals are part of the Goethe-Institut programs in many countries. Local artists and comic lovers dive into German comics in the Goethe-Institut libraries and the big and colourful website ‘German Comics’ . 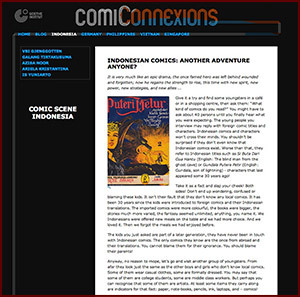 In Indonesia, we started the online-platform ‘Comiconnexions’ in 2011. 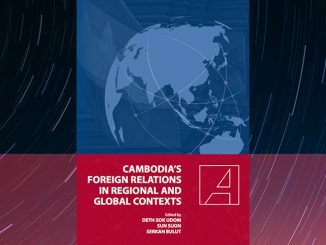 The website connects comic artists in Germany and South East Asia. 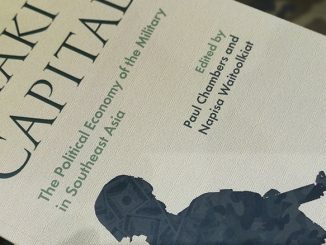 The history of comics in South East Asia is little known to the public, including younger artists. 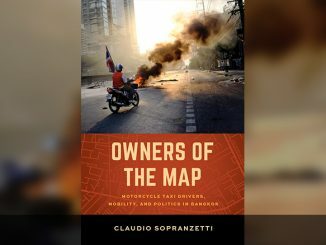 In Indonesia, this history “is very much like an epic drama, the once famed hero was left behind wounded and forgotten; now he regains the strength to rise, this time with new spirit, new power, new strategies, and new allies …” as Surjorimba Suroto, curator of ‘Comiconnexions’ says in his article. The launch of ‘Comiconnexions’ was celebrated with a comic-party, gathering artists and fans from Jakarta. A comic workshop with the German artist Sascha Hommer took place in Bandung, which is one of the creative hubs of Indonesia. The participants were encouraged to think up stories with urban settings with a personal touch, or an autobiographical background. The various attempts—from love stories, action-packed pulp narratives, to thoughtful observations of everyday life—were poured into paper in a short period of time and shown in a final presentation. The influence of manga is recognizable in almost all of the works. Unlike in Germany, where mangaka (manga comic artist) and other comic artist work in separate fields and where overlapping is the exception, those styles are flowing into one another in Indonesia. 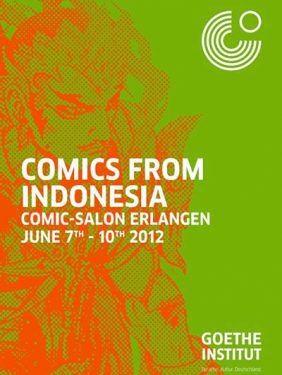 In 2012, the Goethe-Institut started to bring foreign comic artists to the ‘Comic Salon Erlangen’, a biannual gathering of the comic scene of Germany and beyond. 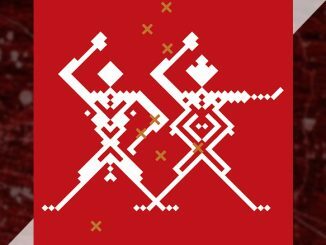 Projects from Russia and the Arab world focused on civil society issues. From Indonesia, Surjorimba Suroto and Imansyah Lubis, curators of Comiconnexions, brought together a group of five comic artists for an exhibition and talks in Germany. Under the official national motto of Indonesia, ‘Unity in Diversity’, the artists were invited to present their approach to comics. They interpreted the motto in their individual way: Azisa Noor in poetic watercolours celebrating the beauty of her multicultural hometown Bandung, Is Yuniarto as the superheroes choice of mythical weapons from all parts of Indonesia, and Vbi Djenggotten with his friendly, round-eyed characters who face a lot of wordly troubles in their every-day-life. Galang Tirtakusuma, who draws manga-style comics with traditional Indonesian backgrounds, showed the variety of food in the Archipelago. Ariela Kristantina introduced her ‘alter ego’, the mysterious Midnight Bunny. The catalogue which includes biographies and examples of the artists works, can be downloaded below. In September 2012, we took another step with a comic festival at Goethe-Institut Jakarta, together with our friends from ‘Institut Francais’ and ‘Akademi Samali’, a Jakarta comic community. The challenge was to reach not only the comic fans and artists, but to bring the art of comics to the general public. The number of visitors was overwhelming, and we understood: Comics are here to stay as a part of our cultural program. The festival was followed by a workshop with Sascha Hommer and Mawil from Germany at Institut Seni Indonesia (ISI) Yogyakarta, one of the leading art schools in Indonesia. Myths and ghost stories were the theme, choosen by the participants. The Germans were astonished about the close and sometimes personal relations Indonesians have with ghosts. Some are considered family members, and many stories were told in the evenings after the workshop days. And the German visitors were warned not to wear green on the beaches of South Java. The Queen of the Southern Sea of Java, Nyai Loro Kidul, goes after young men, especially if they are wearing green clothes. In June 2013, the Goethe-Institut Indonesia together with Kyoto Seika University’s International Manga Research Center and Institut Teknologi Bandung organised an international conference on “Comics Alternatives: From Graphic Diary to Manga Style”. 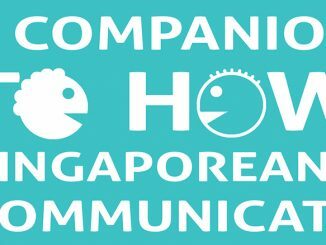 The conference therefore reflected the scope of ‘Comiconnexions’: to connect people who are involved in comics, and bring comics from South-East Asia to the world stage. We continued the workshops with Barbara Yelin, who was invited to participate in ‘Ubud Writers and Readers Festival 2013’. She gave panel talks with comic artists from Australia and Japan, and showed some of her works in an exhibition. Barbara Yeli is one of the most successful graphic novelists of Germany. In collaboration with author Peer Meter she created the graphic novel Gift, meaning ‘poison’ (Reprodukt, 2010). 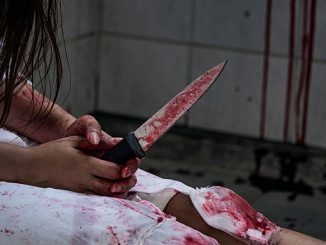 This account of the historic crime case of Gesche Gottfried, a female serial murderer in northern Germany during the early 19th century, has been translated into French, Dutch, Spanish and Swedish. Her latest works include a graphic diary. Some wonderful pictures from Barbara Yelin’s travel sketchbook are available on her tumblr page. 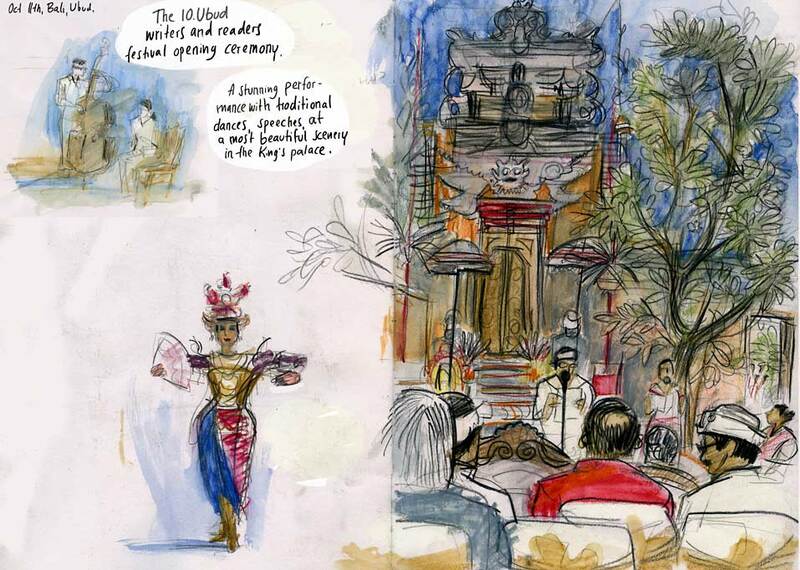 Barbara Yelin’s sketch from the opening of the Ubud Writers and Readers Festival, 2013. Check out other sketches from Barbara Yelin’s Indonesian travels on her tumblr page. The workshop for comic amateurs in Ubud was followed by a workshop for emerging professional artists in Surabaya. The results will be on ‘Comiconnexions’ soon. The same spirit of connection and cooperation led to the comic blog CityTales, started back in 2012. We asked comic artists from nine cities in South-East Asia and Germany to create short stories that tell something about their respective urban environments. Over the course of 12 months, nine very personal, informative and often funny stories developed. 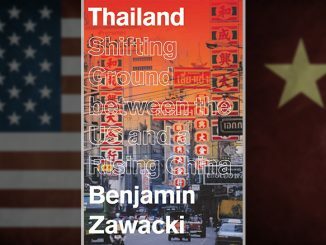 Responding to a series of themes (like food, street fashion music, animals in the city), these artists came up with a colourful and lively description of life in Germany and South-East Asia. Their styles vary from ‘clear lines’ to manga and collage, underlining the freedom of today’s artists to choose any style that fits their story. A few weeks into the project our international team realised the creative potential of the project. In order to increase exposure for the artists, some stories where shown as a poster exhibition in Jakarta (Indonesia), Sydney, and Melbourne (Australia). In 2014, the CityTales book is published as a physical reminder of the great stories told by these artists. 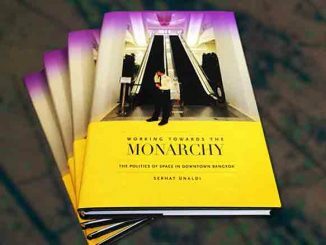 The book launches at Leipzig Book Fair, one of the biggest book festival in Germany. These fairs are international showcases for authors, artists and publishers. In Germany, the market for comics, especially graphic novels, has grown considerably over the last years. To give a better insight into the comic events in Europe, we invited comic artist Jhosephine to travel to Germany in 2014. 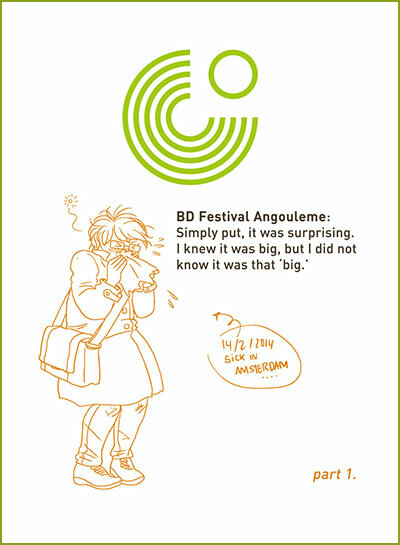 She started with a visit at Angoulême, the biggest comic festival in Europe. In February, she moved on to Berlin and worked with some German comic artists there. 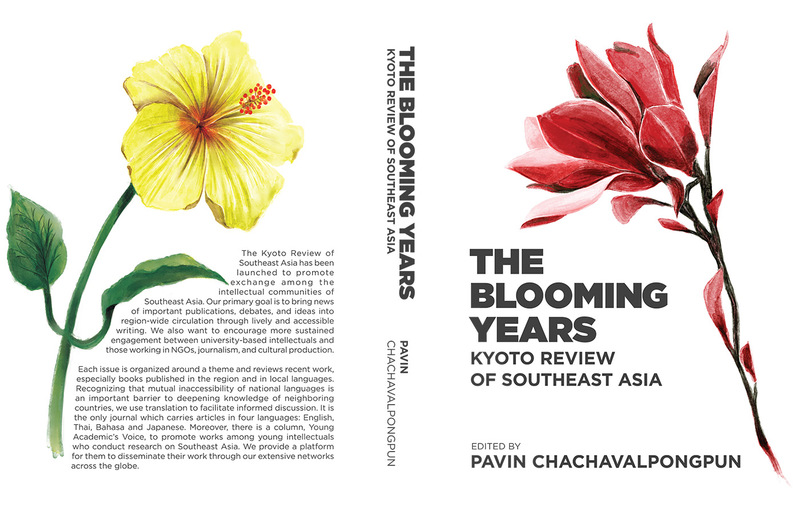 Eventually, she will join the book launch in Leipzig. You can follow her travel notes on the Comiconnexions blog. Comics have come a long way. Back in the 1980s, comics in Germany were still frowned upon by many, regularly regarded as an inferior art from, or not even as art at all. Positioned in a no-man’s-land half-way between literature and visual art, they were treated as light entertainment, more often than not crossing over into the world of advertising, graphic design, animation and film. Today, comics are seen as a new art of our time, a happy marriage of story and graphic art. German publishers look for ‘graphic novels’ to reach a mature audience of novel readers, beyond the younger manga fan-base. Comics have ‘grown up’; they are now part of literary festivals. Graphic novels are reviewed in the ‘literature pages’ of newspapers, which can make a book’s success (or failure). At the same time, comics find their way back into the daily newspapers as strips. But not as ‘funnies’ like in the old days, but rather as comments on political and cultural debate, often quite philosophical. This is a good way for artists to make their comics known, and earn a living. Nevertheless, comic events in Germany always draw cosplayers and young manga fans as well as renowned artists. The ‘CityTales’ book and blog is therefore at the right place at Leipzig Bookfair’s comic center stage. 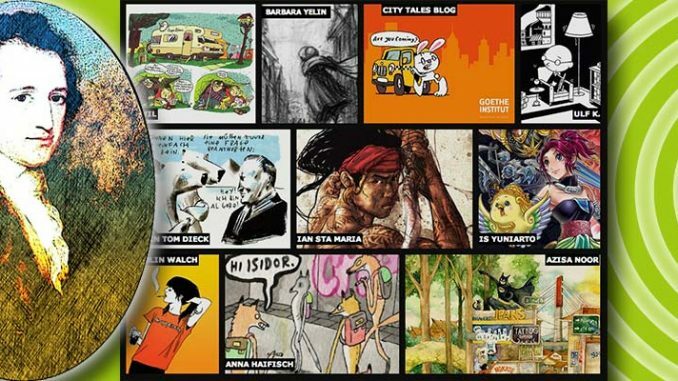 Indonesia will present its best authors in Frankfurt 2015, and comics will be part of it. Indeed, comics are big in Frankfurt, with 180 events in 2013 and comic publishers looking for new authors. You can check for more information here. Christel Mahnke is Head of Information and Library Services for Goethe-Institut Jakarta, Indonesia.